An ice cream for a smile: Fassi and CESI onlus relaunch the Keep the Smile On campaign dedicated to children with Cat-Eye syndrome. No one more than a child knows how to face life. Adults often forget the importance of a smile even for no reason, but a child never forgets it. The thaumaturgical power of a laught has long been proven as a powerful self-cure in the disease and in summary it has been shown that even an induced smile can stimulate those same centers that activate happiness! 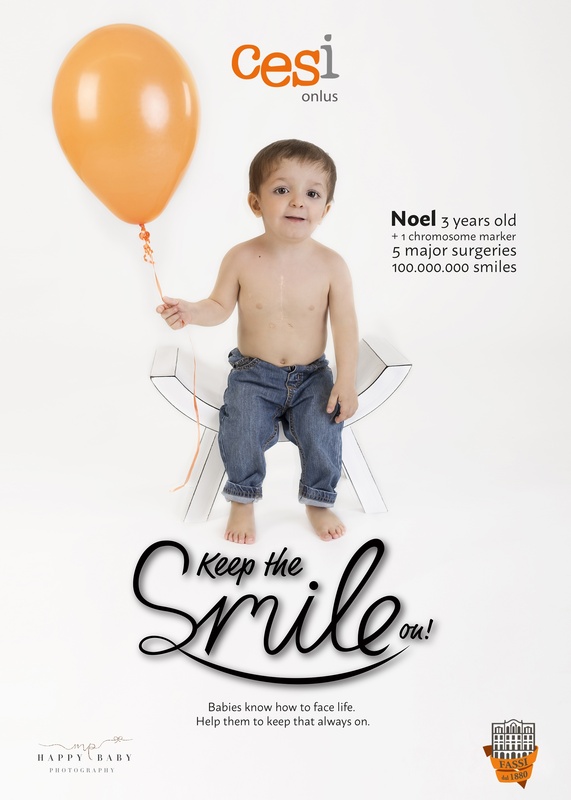 For this reason, on April 17th 2019 the Cat Eye Syndrome International Onlus (CESI onlus), referring to the last World Awareness Day on Cat Eye Syndrome (22 March), wants to give everyone a smile by re-launching the awareness campaign "Keep the Smile on! " together with an exceptional partner: the Fassi ice cream shop in Rome. Testimonial of exception is Noel, an Italian child affected by the syndrome, who despite several surgeries and spending over 13 months of hospital in his first 24 years of life, never stopped giving smiles to his family, giving them the courage to continue every day fight at his side and, through the CESI non-profit organization, alongside all the other children affected by this terrible disease. Because to live our suffering without forgetting what makes us happy anyway is possible and this is what these children teach us. So, the historical and famous Italian ice cream maker Fassi has decided to support this smile through the Cat Eye Syndrome International Onlus, dedicating a day to the association and a special taste of ice cream whose proceeds will be entirely donated to the CESI non-profit organization. "Last March 22nd it has been the Day of awareness of the Cat Eye syndrome and as part of the #Fassiforchildren activities we organized a dedicated initiative - says Andrea Fassi, managing director of Palazzo del Freddo G. Fassi - together with the parents of little Noel , Sylvie and Alessandro, we met personally on the occasion of the presentation of the book «The Child with the Magic Smile » written by Chiara Ceneroni. We need more information and awareness of a rare disease that may let many parents feel disoriented. Raising the Keep the Smile On campaign with our ice cream shop, we want ice cream to become a vehicle for a smile for all Cat-eye children ". The appointment is April 17th, 2019 at , 5:30 pm in the Giuseppina Fassi Room in Via Principe Eugenio 65-67, together with Andrea Fassi and Gigi De Palo, President of the National Forum of Family Associations. There will be several families and other people who will bring their own experience with the syndrome. Germano Carella, founder of Dramabooks, an association that realizes scripted audiobooks (Drama Fiction). Chiara Ceneroni, author of the story "The child with a magical smile", Morphema Editrice, dedicated tonand freely inspired by Noel; for the occasion, the publisher Fabio Lanfiuti Baldi will release the rights of the fairy tale to Dramabooks to create an audio book whose proceeds will be donated to the CESI Onlus association. " The new projects of the CESI Onlus association will also be illustrated and the "Keep the Smile On" fundraising campaign will be re-launched to carry out all the initiatives of the association. And if you really couldn't take an Fassi ice cream with us on April 17TH 2019, remember that it's always possible to become "Ambassadors of the smile" by purchasing on the Worth Wearing, crowdfunding platform in order to finance projects and ideas for change, the “Keep the Smile On! ”linked to the CESI onlus campaign. 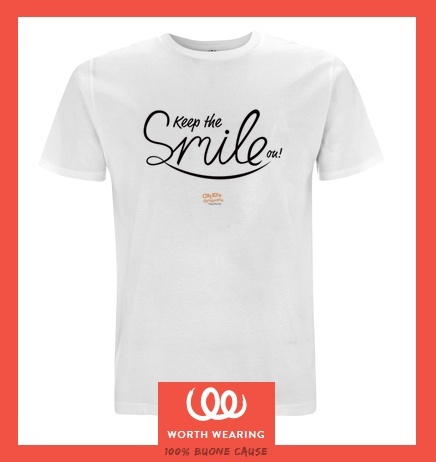 Wear this t-shirt and spread the smile! Buying this t-shirt, You will contribute to stretch to children affected by this terrible disease and face everyday of their life with big courage and joy. In fact, Cat Eye Syndrome is a rare disease, a malformative no degenerative syndrome caused by a genetic anomaly of Chromosome 22. Children which are born with this syndrome suffer corrective surgeries since their first days, struggling for their life day in and day out. But, despite of this continous fight, they never lost the smile. Help us to keep that always on! "Keep the smile on!" and become ambassador of the smile together with us! A warm thank to "Happy Baby Photography"
and Marianna Pavone for the cooperation and the photografic shooting.